For the second consecutive evening Ireland defeated Spain to take a 2-0 lead in the 4 test series kindly supported by Phoenix Gas. A late withdrawal from the Irish starting XI was Chloe Watkins due to hamstring strain in the warm up. Chloe was due to get her 150th cap on the evening and had to be replaced. The birthday girl and Ireland 's most capped female player Shirley Cay was brought into the 18 man squad. It was Shirley's first match back following a nasty hand injury whilst in Hawkes Bay in March. The game also saw Irish Coach Graham Shaw introduce two new caps, UCD Aisling Naughton & Trinity's Anna Mae Whelan. The opening 10m was an even affair with the the best chance falling to Deirdre Duke but her reverse strike went over the cross bar. In the final minute of the quarter an unforced error by G. Frazer saw Spain get their first PC but their shot was cleared Ireland countered and it was G Frazer this time winning Ireland's first PC and from a retake of the initial PC, Anna O Flanagan got a lovely touch from Wilsons strike to give Ireland the lead. Spain won two corners to Ireland's none in the third quarter, the first hit the cross bar with the rebound ballooned over and the second was scored but chalked out by the umpires as the ball had not been stopped outside the circle . The final quarter saw some good saves by McFerran but she was left with no chance when in the 50m, from their 4th PC, Lola Riera drag was roofed to bring Spain level. Riera had another chance to give Spain the lead, from a 56m PC award but this time drag was wide of the mark. Ireland will meet Spain in Jordanstown on Thursday 12noon and then again on Friday at 11am in their third and fourth tests. Following their fourth place finish at the London 2012 Olympics, Great Britain have set their sights firmly on winning a medal at Rio 2016. Looking at their recent history, you certainly would not bet against them. There has been a steady improvement since their disappointing ninth place finish at the Athens 2004 Games, with the team taking fifth at Beijing 2008 before losing the bronze medal match at London 2012 against Australia. The team coached by ex-England and GB striker Bobby Crutchley sealed tickets to both Rio and the Hero Hockey World League Final in Raipur, India, with their third place finish at the FINTRO Hockey World League Semi-Final in Antwerp, Belgium, thanks to a 5-1 win over India. A largely experimental side was sent Raipur, where Great Britain finished in sixth place. The most experienced player in the provisional squad named for the Hero Hockey Champions Trophy is talismanic attacker and team captain Barry Middleton, a veteran of 360 international appearances. Brilliant midfielder and penalty corner expert Ashley Jackson is also included, as are and attack-minded trio Harry Martin, Simon Mantell and Nick Catlin, world class central defender Iain Lewers and charismatic goalkeeper George Pinner, who could make his 100th senior international appearance in front of the home fans at London’s Lee Valley Hockey and Tennis Centre. 32-year-old forward Simon Mantell – a star performer at the Hero Hockey World League Final in Raipur with four goals – is another player who could potentially reach a caps milestone if selected for the Hockey Champions Trophy. Mantell currently sits on 199 international appearances, and will be hoping to reach the 200mark at the Olympic legacy facility. Great Britain recently travelled to Australia to face the Kookaburras, claiming a 2-2 draw in the first test before losing 4-3 and 5-1 in the second and third tests respectively. They will be looking for home support to cheer them to their first ever Hockey Champions Trophy title, and in doing so provide a great springboard for Team GB going into the Rio 2016 Olympic Games. Player perspective – Dan Fox (Defender): "We're excited. It's the first Champions Trophy any of us have played on home soil and it is a tournament that we want to win for the first time. Everything we do this year is part of our Rio preparation. That said, the Champions Trophy is a major trophy and we will be trying full out to win it. The tight turn around between games is also great preparation for the tough schedule in Rio, so it will be good practice." One to watch: Ashley Jackson. Alongside team captain Barry Middleton, the 28-year-old midfielder is one of Great Britain’s most gifted individuals. He possesses fantastic stick skills, a terrific eye for a pass and is one of the finest penalty corner drag-flickers in the world. As always, Jackson is expected to be one of the stars of the show in London. The International Hockey Federation (FIH) is delighted to confirm that the men’s Hockey Junior World Cup 2016 will be played in the Indian city of Lucknow in the state of Uttar Pradesh. Taking place between 8-18 December, the men’s event will feature 16 of the world’s best junior men’s teams. Those qualified are: Argentina; Australia; Austria; Belgium; Canada; Egypt; England; Germany; India; Japan; Korea; Netherlands; South Africa; New Zealand; Pakistan and Spain. The Hockey Junior World Cup is a spectacle of new talent - the perfect platform for young players to unleash their raw skill onto the international hockey scene. Competing for the ultimate prize, this event is always an exciting and action-packed competition where new rivalries are made and lifelong friendships begin. 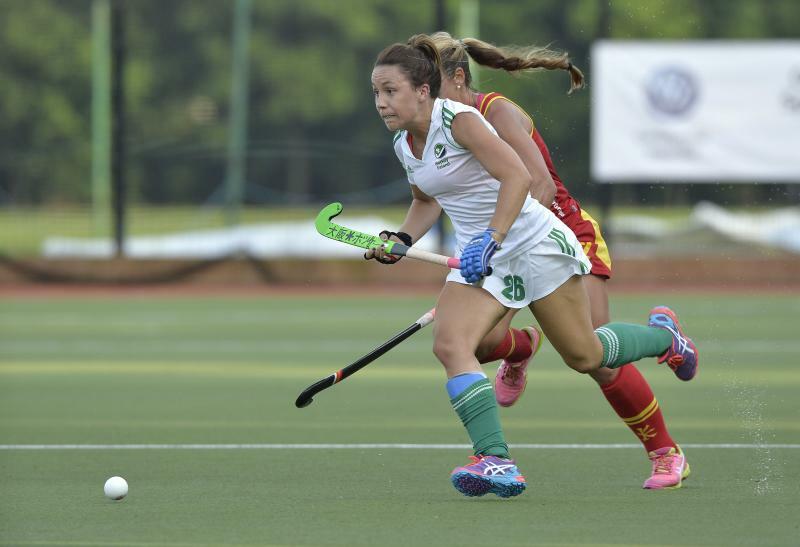 Whilst the men’s competition takes place in December, the women’s Hockey Junior World Cup takes place shortly beforehand in Santiago, Chile between 24 November and 4 December. There Argentina, Australia, Belgium, Chile, China, England, France, Germany, Japan, Korea, Netherlands, New Zealand, South Africa, Spain, USA and Zimbabwe will be battling it out to be crowned the women’s Junior World Cup Champions. Black Sticks defender Kathryn Henry will be sidelined for the rest of the year after snapping her ACL last week. The 25-year-old, who has played 41 tests for New Zealand, suffered the injury during a practice match against India in the squad's build up for the International Hockey Open in Darwin. While sprinting to make an intercept she felt her left leg lock up before crashing to the ground knowing something was seriously wrong. Upon returning home scans confirmed the damage and Henry is now waiting for swelling to reduce before surgery to repair the anterior cruciate ligament, which will sideline her for at least nine months. The injury comes just weeks after fellow Black Stick Shiloh Gloyn suffered the same injury to her right knee. “As I was sprinting I just felt something go, I did a bit of a hurdle jump and then went down onto the turf,” Henry said. “I had seen what happened to Shiloh a few weeks earlier so I think I knew pretty much straight away that I had done my ACL. “It’s really disappointing but I will come back stronger and I have a great team of medical staff around me who will help make sure I’m back out on the turf next year. Black Sticks women's coach Mark Hager is leaving the Olympic door open to those who've missed the cut for the Champions Trophy. Goalkeeper Georgia Barnett swaps out for experienced custodian Sally Rutherford, while midfielder-striker Julia King is another to miss the cut. Hager says he was impressed by what King offered at the recent International Hockey Open in Darwin. He says by no means have they closed the door on those players. 21-year-old Liz Thompson is one of four players named in a leadership group for the tournament in London. Canada’s Women’s National Program has selected nineteen athletes for the National Team that will compete in four games with Japan from June 23-28 in Osaka and Gifu, Japan. Led by team captains Danielle Hennig (Kelowna, BC), Kate Gillis (Kingston, ON), and Thea Culley (Rossland, BC), of the nineteen athletes, sixteen were a part of the Canadian team that competed at the 2016 Hawke’s Bay Cup in New Zealand in April. The roster also features fourteen of the sixteen athletes who won a bronze medal for Canada at the 2015 Pan American Games in Toronto last summer. The other three athletes joining the touring team in Japan – Alexis de Armond, Nikki Woodcroft, and Shannon Pereira – were representing Canada at the Under-21 level at the 2016 Junior Women’s Pan American Championship in Trinidad and Tobago while the senior women were in New Zealand in April. For De Armond and Woodcroft, the Japanese tour will be their second international competition after they both – along with teammate Rowan Harris, who is also headed to Japan – made their senior debut in San Diego earlier this year. Pereira, a native of Toronto, Ontario who is part of a group of junior athletes which has been training with the senior women since the beginning of the year, will be making her senior international debut for Canada in Japan. The Canadian women will arrive in Japan on June 18 and play matches on June 23, 25, 26 and 28. For game times, results, and recaps click here. Last weekend saw 3 of Scotland’s team take on Wales and Great Britain U23s. Friday saw Scotland U16 Boys play Wales at Glasgow National Hockey Centre. Wales took an early lead from open play in the 20th minute but Scotland grabbed an equaliser just before the break through Struan Walker. The second half saw Scotland get into a rhythm and took control of the match. They scored 3 goals within 4 minutes, coming from Jamie Golden (x 2) and Ben Pearson. The final goal of the match was through Andrew McConnell who picked the ball up just outside the Welsh 25, placed his shot past the keeper to complete a 5-1 victory. As the sun was shining upon GNHC it was Scotland U16 Girls turn to take on Wales. The match started bright with Scotland having a few chances on goal. Scotland then took the lead in the 14 minute with a penalty corner from Maris Cawthorn. Scotland doubled their lead on the 21st minute through Lucy Hogarth. Wales started to apply pressure in the second half and looked to threaten Scotland’s goal on the break. However, Scotland were able to increase their lead with another penalty corner this time being scored by Emily Dark. This did not waver Wales though as they pushed to get a goal and it came in the 56th minute through Katie Partridge. The match finished with a 3-1 win to Scotland which gave them confidence going into the second match. The U16 Boys were back in action against Wales for the second time in as many days. Fraser Moran opened the scoring for Scotland after 7 minutes with a delightful drag flick from a short corner. However, Wales levelled after the award of a penalty stroke. This was slotted home by Will Riley. 3 minutes later Scotland took the lead again as Fraser Moran doubled his tally from a short corner. Wales were not giving up as they converted a short corner in the 22nd minute to make it 2-2 through Rory Calderwood. Just before half time Jamie Golden returned Scotland to a lead to make it 3-2 going into the break. Scotland came out fast in the second half scoring a further 4 goals to make the score 7-2 to the home side. Goals came from Kyle Bannerman, Struan Walker, Kyle McGhie and Ben Pearson to round off a well-deserved victory for the Scots. Scotland Senior Women took on a new challenge in the Great Britain U23s. The GB squad featured 4 Scots from the Scottish side; Nicola Skrastin, Amy Costello, Nicola Cochrane and Millie Brown. GB side had a comfortable 3-0 lead at half time proving to be the stronger of the two teams on the day. GB went on to score a further 2 goals in the second half, with Scotland getting a consolation goal through Becky Merchant to bring the final result to 1-5. Scotland Senior Coach described the performance as very poor from the Scottish side with plenty of room for improvement in the second fixture. The final game of the day saw the return of Scotland and Wales U16s Girls for their second match of the day. Scotland were in control of the match from the beginning with many chances but they were unable to covert. It wasn’t until the 15th minute when Scotland opened the scoring through Emily Dark. Scotland then capitalised on their lead 7 minutes later with a goal from Georgia Smith. Straight after half time Scotland increased their lead with Emily Dark getting her second of the match. Despite playing well Wales could not quite convert any chances that fell their way. The Scotland girls continued to play with confidence and scored a further 2 goals through Milly Merry and Ruth Blaikie to round off a terrific performance and 5-0 win for the girls in blue. The first game of the day was to be the third and final match between Scotland and Wales U16 Girls. Scotland were looking to make it 3 wins out of 3 in the sunshine of Glasgow. The match was well contested by both teams in what was a very warm day. Wales were determined to improve on their performance from the previous day. It was Scotland who once again took the lead through Emily Dark after converting another penalty corner making that her 4th goal of the weekend. Wales got the equaliser they were hoping for on the 45th minute through Carys Waters. The equaliser was short lived though as Scotland’s Joanne Boyle handed the lead back to Scotland in the 49th minute. The rest of the match saw chances fall to both teams but they were unable to take advantage of these and the score remained 2-1. This gave Scotland the 3rd win of the series in what was a great weekend of hockey by both teams. The second match of the day saw Scotland U16 Boys take on Wales for the final time. After long periods of pressure Scotland took the lead through Andrew McConnell with a reverse across the goalkeeper. 2 minutes later Ben Pearson converted from the penalty spot. Kyle Bannerman completed the half with a deflection from a short corner routine to make it 3-0 at the break. John Stephen and Struan Walker increased Scotland’s lead to 5-0 after 15 and 25 minutes. Wales got a late consolation goal to bring the final result to 5-1. Similar to their female counterparts Scotland boys completed 3 wins out of 3 in the series against Wales. Huge well done to everyone involved. The final game of the day saw Scotland Women try to redeem themselves against a strong U23 Great Britain side. The performance from the Scots was night and day to the previous match. The Scottish girls began to show their determination when Nikki Lloyd slotted home a rebound from a corner. Scotland doubled their lead through Bex Condie after a straight strike for a penalty corner. The match finished 2-0 to the home side and all credit must be given to the Scottish girls for bouncing back after the defeat on Saturday. The Women’s head coach believed performances from every individual were far better than Saturday and the girls should be very proud of themselves for the positive mind-set they showed throughout the game. The final four for the Austrian league was finalised with reigning champions HC Wien joining SV Arminen, NAVAX AHTC and VeriFone WAC in the end of season playoffs. Arminen topped the table with a 3-2 win over SV Post to deny the latter a place in the end of season finale due. Christoph Turek broke the deadlock for Post to give them hope of a surprise result but goals from Michael Bergner, Dominic Uher and Florian Steyrer swapped the advantage. Ahmed Zeid Fouda got one back for Post with only seconds left but too late to grab the result they needed to breach the top four, missing out by a single point. Arminen ended the regular season with 12 wins and just one loss from their regular season campaign to make them favourites in the end of season playoffs. There, they will face HC Wien on June 18. They lost 3-2 to VeriFone WAC on the final day of the season with Egyptian Ahmed Mansour adding to goals from Hannes and Mathias Podpera. NAVAX AHTC completed the regular season in second place thanks to a comfortable 10-3 win over HC Wels. It was 5-1 at half-time before adding to their tally in the second half with Dominik Monghy scoring four times. AHTC meet WAC in the second semi-final on June 18.